Tasnim – Spokesman for the Iranian Administration Mohammad Baqer Nobakht described recent US sanctions against the Islamic Republic as a violation of the 2015 nuclear deal, also known as the JCPOA, pledging that Tehran will take “a decisive action” on the issue. 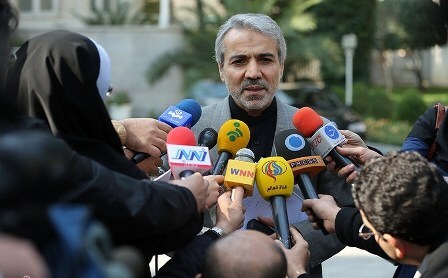 Speaking to reporters at his weekly press conference in Tehran on Tuesday, Nobakht underlined that Washington’s fresh sanctions against Tehran would be definitely in violation of the Joint Comprehensive Plan of Action (JCPOA). He further said the Iranian administration is pursuing the issue, adding that a group is “monitoring” the violations of the nuclear deal by the other parties. “We will not give up any of the national rights in this agreement, and as soon as we receive official reports (on breaches of the deal)…, we will take a decisive action,” the spokesman stressed. Last Tuesday, the US state department and department of treasury announced that they were targeting 18 Iranian individuals, groups and networks over the Islamic Republic’s missile program. The ministry said that Tehran will respond to the US move, and added that Iran will, in turn, impose new sanctions against a number of American individuals and entities that have taken hostile steps against the Iranian nation and other Muslim nations in the region. Iran and the Group 5+1 (Russia, China, US, Britain, France, and Germany) on July 14, 2015, reached a conclusion over the text of the JCPOA. The accord took effect in January 2016 and was supposed to terminate all nuclear-related sanctions against Iran all at once, but its implementation has been hampered mainly due to US policies.